This post is well over due. This is a dish mom used to make and I've never tried making it myself until now. A lot of recipes call for canned hominy rather than getting the dried kind but mom always used dry so that's how I made mine. You can usually find it in the Mexican section of the grocery store. You can used canned though I don't think I've had it. I have heard that the canned hominy has a waxy texture and doesn't taste as good. 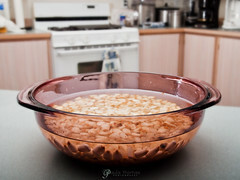 Using dried hominy takes longer because it requires you to soak it in water overnight much like you would with beans. 1. Drain posole and put in large stock pot. Add chicken broth, chopped onion, minced garlic. Bring to a boil and then reduce to a simmer. Simmer for 3.5 hours, stirring occasionally. 2. 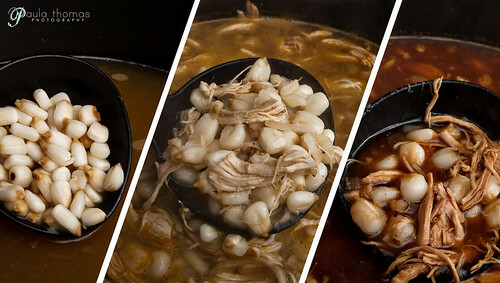 While posole is simmering, heat 2 tablespoons olive oil in a deep skillet over medium-high heat. 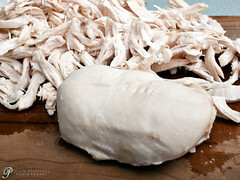 Add chicken breasts, and cook until no longer pink and juices run clear, about 20 minutes. Remove from skillet, drain, and cool. When completely cooled, shred chicken with a fork and set aside. 3. While posole is simmering, soak chilies in hot water for 1 hour. Remove stems and seeds. Puree with a couple of tablespoons of the water to puree. 4. 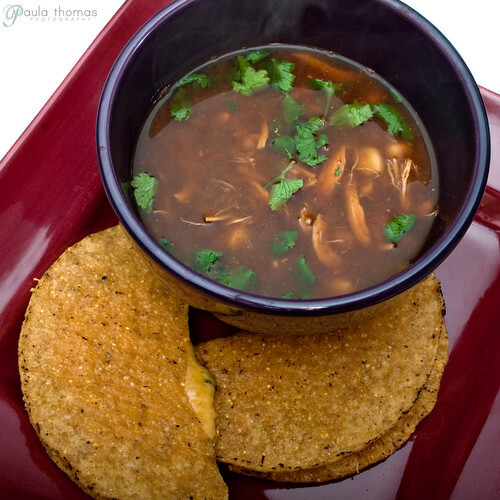 After posole has been simmering for 3.5 hours, add shredded chicken, chile powder, cayenne pepper, and cumin. Add more water or chicken broth if needed. 5. Push the ancho chile puree through a strainer into the pot. The color of the broth will change several colors throughout the process. 6. Add salt & pepper to taste and stir occasionally as it simmers for 1 hour. 7. I like to garnish with fresh cilantro and serve with tortilla chips or corn tortilla quesadillas.